A newborn's charred remains turn up in a woodstove. A small plane crashes in a North Carolina cornfield on a sunny afternoon. Both pilot and passenger are burned beyond recognition. And what is the mysterious black substance covering the bodies? Most puzzling of all are the bones discovered at a remote farm outside Charlotte. The remains seem to be of animal origin, but Tempe is shocked when she gets them to her lab. With help from a special detective friend, Tempe must investigate a poignant and terrifying case that comes at the worst possible moment. Daughter Katy has a new boyfriend who Tempe fears may have something to hide. And important personal decisions face Tempe. Is it time for emotional commitment? Will she have the chance to find out? Everything must wait on the bones. Why are the X rays and DNA so perplexing? Who is trying to keep Tempe from the answers? Someone is following her and Katy. That someone must be stopped before it's too late. At only 5 hours, it's somewhat too short to really sink your teeth into. I've not picked up any of the other books in the series, but I wouldn't be adverse to it in the future. It's episodic enough that you won't miss anything by jumping into the middle. Watch out for the accents, though: Michele Pawk does justice to the southern drawl of the region, and it can be jarring at first. 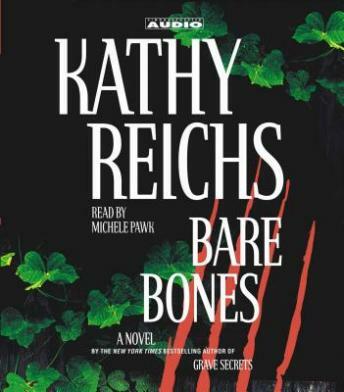 I usually enjoy Kathy Reichs and this one was no exception. I loved the descripitions of Charlotte. Not Reichs' best, but still interesting. Hope she hasn't sacrificed her literature for the television series! I really have enjoyed her books. Having lived near Charlotte it is always fun to hear of streets and sites I have visited. She has a nice blend of the story, the facts, and little extras that make it great. I really love Temperance Brennan. She has nothing to hide and is intelligent beyond normal means. I enjoyed the story and love the characters. I can't wait to read another one. Good book. I'm much more partial to unabridged versions, however, and I missed the usual detailed Brennan science. I'll read another of Reichs books--anytime I can. Good listening. I really enjoyed Bare Bones. Kathy Reich's characters are very believeable and enjoyable. A very good way to spend a drive.